How long do you think it would take you to shake the hands of 10,000 people around the world? It took me about a year and I will have completed much of it during the sound bites and commercials of a live TV newscast. Come July 2012, 10, 000 is the estimated number of people I will have “hung out" with on Google Plus. If you’re a newscaster, politician, or anyone who gives a flying flip about “engagement”, the fact that a small market news anchor is able to personally interact globally with 10, 000 people in a year might make you want to turn the light on your own “virtual front porch”. 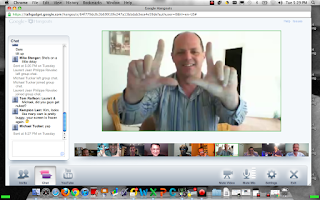 Google Plus Hangouts are what +Vic Gundotra calls Virtual Front Porches. Basically, these group video chat rooms are allowing people globally and locally to find each other and meet face to face. A hangout is a magic carpet that can take you around your town or around your world in a matter of seconds. 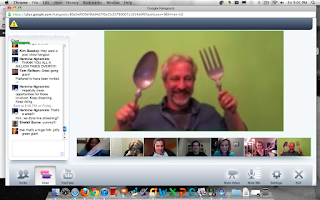 Google Plus is a social network but not just for your friends. +Cliff Roth calls it a virtual “super convention” or “trade show.” You can visit the booths at photographer’s alley, newscaster’s alley, musician’s alley. I use my Hangout as a listening post for viewers during our live newscast. 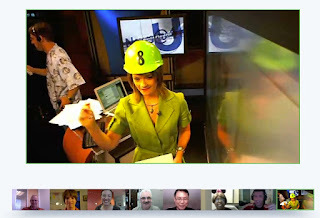 We also use Hangout as a live satellite truck and a viewer's forum for group conversations about the day’s news. In 2005, David Teten & Scott Allen ‘s book likened social media interaction to a “Virtual Handshake”. In 2012, that handshake is a lot more human than any text based tweet, LinkedIn or Facebook interaction. Currently, there are no quantitative data to support my anecdotal evidence that the level of engagement with someone face to face in a Hangout exceeds the level of a text-based interaction on another social network. But why else would someone in Brazil, Pakistan or India regularly tune in to watch KOMU News, a local program in Columbia, MO? It’s a personal interaction. Social Media=Human Media and it doesn’t get more human than a living breathing person. When I read a story about a child’s death, I hear the Hangout guests sigh in my ear. I wear two earpieces, one in my right ear for the producer and another in my left ear to hear my Hangout. My laptop is filled with a collection of 9 omniscient narrators talking to me during the newscast. They correct me. They question me. They give me silly words to try to work into my scripts. The viewer has left the living room and is sitting right next to me on the news set. I’ve told several of my research friends someone needs to test my Hangout theory. Viewers talk to an anchor face to face in a Hangout, they feel connected to that anchor. Viewers text chat with the anchor’s avatar via a tweet, they do not feel as connected. Perhaps your 12 year old needs a science fair project? And while he’s at it, I could use a third ear. Due to the human interaction in Hangouts, I would argue your “Hangout Count” (how many people you’ve hung out with) might be a better barometer of interactivity than your Follower Count. A high following does not equal high engagement. Perhaps +Circle Count or someone in coder’s alley will figure out a way to determine how many people we’ve actually hung out with thus far? By a rough estimate, I’m currently at 7, 200 and my Hangout Count should hit 10, 000 in July. Here’s a journalist doing math. On Monday, April 23rd, KOMU will start a new noon newscast called KOMU News @ Noon (This is a rebranding for U_News. We’re changing the timeslot, graphics and music). It will continue to push the boundaries of interactivity and will also feature you…. 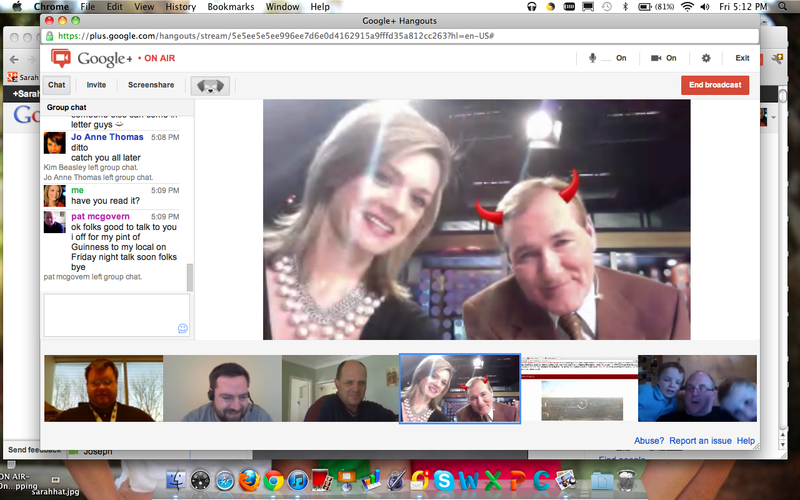 in Hangouts on TV. This airs on “TV” and on “GP” at Noon (Central), 1pm (Eastern), 10pm Lahore, 7pm Paris…3am Sydney. By the way, as evidence of the level of connection we have people who get up at three in the morning in Australia to Hangout with us. Crikey! Michael Tucker of Australia on KOMU's "Cyber Couch"
The most common feedback we get from people who join our Hangout is “I wish my local news anchor did this.” Anchors: All it takes is a laptop and the guts to punch through the TV glass and allow viewers to talk to you…. not just text you on social media. News Managers: Be transparent...warts and all. Don’t put a velvet rope around your news set. People want to interact with your anchors live from the studio. Let’s swap stories on this virtual front porch. I’ll leave the light on for ya. 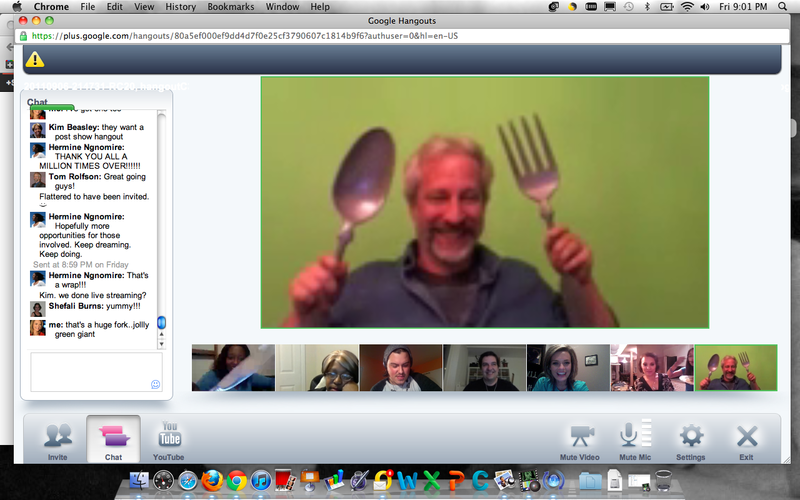 I seriously need to get into hangouts. Unfortunately, I work in an office with old fashioned desktop PCs - and no webcams! So, I'll have to find the time to do them in the evenings instead.